In January 1936 King George V died, to be succeeded by his son who became Edward VIII. Edward, who was in love with the American divorcee Wallis Simpson, was forced to make a choice between Mrs Simpson and the throne. Putting love before duty he was succeeded by his brother who became King George VI in December that year. This is a scan of the actual sheet. 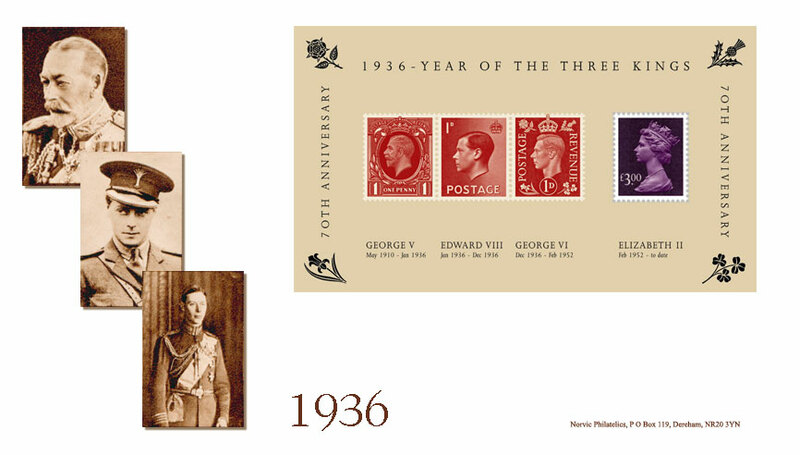 The miniature sheet contains a single £3 Machin definitive, and non-postally valid reproductions of the 1d red King George V (photogravure), King Edward VIII, and King George VI stamps. 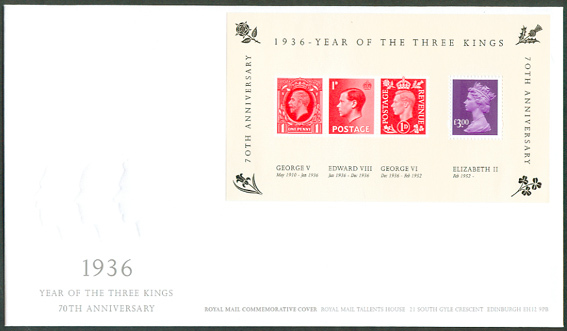 In the corner of the sheet are national floral emblems as shown on the King George VI stamp designed by Eric Gill. Although there is no new stamp, as the £3 stamp has been issued previously, Royal Mail have announced a Commemorative Cover for this sheet. The £3 stamp appears to be a good match to the one issued in conventional sheets. Designed by Together Design Ltd, the sheet is printed by De La Rue Security Print in gravure. Dimensions: 126mm x 73mm. We have produced a small number of First Day Covers for this issue which will be available with postmark M10173 or L10165 . Sheet on PO fdc* with any available postmark - Price £4.75. 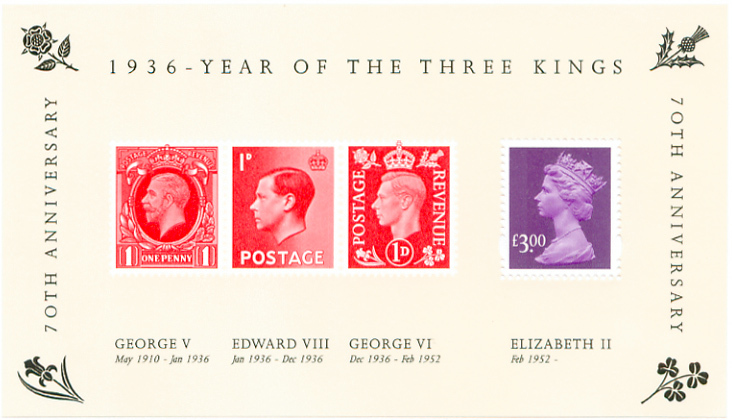 * As the PO fdc is 'illustrated' with uncoloured embossed heads of the kings, similar to the heads on the stamps, viewers will have to imagine that they can see it below! Special Postmarks available on the day of this issue are shown here; others will be added as they are announced. These images may not be to scale..